The Soyuz rocket lifted off at 0203 GMT (9:03 p.m. EST). A Russian Soyuz rocket fired six satellites into space Friday, launching missions to serve defense agencies in Europe and Chile with high-resolution imagery and electronic intelligence. The passengers included France's imaging platform, four French ELISA electronic intelligence satellites and the SSOT Earth observation satellite for Chile. Liftoff of the 151-foot-tall Soyuz launcher was at 0203:48 GMT (9:03:48 p.m. EST) from the Guiana Space Center on the northeast coast of South America. Lighting up the night sky with brilliant orange flame, the kerosene-fueled rocket dodged scattered clouds and flew north away from the French Guiana spaceport. The rocket's core stages finished their job in less than 9 minutes, then a Fregat space tug guided the Pleiades and ELISA payloads to an orbit nearly 435 miles above Earth. The 2,138-pound Pleiades 1 satellite and four 265-pound ELISA spacecraft were deployed from the Fregat upper stage about one hour after launch. Two more brief firings of the Fregat main engine adjusted its altitude to 379 miles for the release of SSOT, a French-built imaging satellite for Chile's government. Separation of SSOT was confirmed at about 0530 GMT (12:30 a.m. EST), and officials heralded the mission as a success. 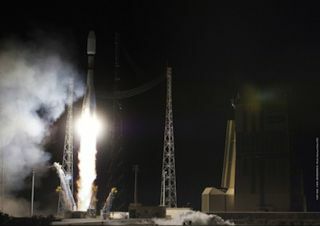 "As you have just seen, the second launch of Soyuz from [French Guiana], which came less than two months after the first, has just put into orbit six spacecraft for our customers at the end of one of the most complex missions ever carried out," said Jean-Yves Le Gall, chairman and CEO of Arianespace. Artist's concept of the Pleiades 1 satellite in orbit. With the Soyuz and Vega, which will make its first flight next month, Arianespace will operate rockets from French Guiana covering the light, medium and heavy launch markets. All the payloads orbited by the Soyuz on Friday night were manufactured by EADS Astrium. "This is particularly significant for us at Astrium," said Jean Dauphin, Astrium France's director of Earth observation and science. "It's quite a challenge and I have to say I'm really satisfied it was such a success." Led by CNES, the French space agency, Pleiades 1 will collect high-resolution optical imagery for military and civilian users. CNES reported the Pleiades 1 satellite was acquired by ground stations and was operating normally soon after launch. "Pleiades is an Earth observation system with two 70-centimeter [2.3-foot] very high-resolution satellites for optical and infrared observation," said Yannick d'Escatha, president of CNES. "The satellites, weighing one [metric ton], are placed in a sun-synchronous orbit 700 kilometers from the Earth. They have a four-meter [13.1-foot] span and are very agile, allowing for daily access to any point on the globe." The Pleiades system is also partially funded by Belgium, Sweden, Spain and Austria. It will complement France's Helios government spy satellites and the Spot series of commercial imaging craft. Spain and Italy will receive priority data for military needs under separate agreements with the French defense ministry. Civil users will receive about 95 percent of the capacity from the Pleiades system through Astrium Services, the company responsible for commercial imagery dissemination, but time-sensitive military requests will be expedited. "We have to meet the requirements of French and Spanish military users, as well as civil, institutional and commercial clients. Military tasking requests will take priority," said Alain Gleyzes, a senior CNES manager with the Pleiades program. Artist's concept of the SSOT satellite in orbit. Designed for a five-year mission, the agile Pleiades satellites each carry a Korsch telescope built by Thales Alenia Space with a primary mirror 2.1 feet in diameter. Its CCD detectors are 40 times more sensitive to light than those in standard consumer digital cameras, according to CNES. Officials say Pleiades 1 will be in its final orbit about 10 days after launch. When operational, it will collect up to 450 images each day, including tri-stereo imagery and mosaics. "These images will be used in France or in theaters of operations for activities such as site monitoring, targeting, urban mapping and the conduct of operations," said French Gen. Laurent Collet-Billon, director of the military's DGA procurement agency. Pleiades 2 is due for launch at the end of next year. Both satellites will cover every spot on the globe in 24 hours, according to French space officials. The ELISA satellite quartet will map radar emissions worldwide, characterizing and cataloging their sources for use in electronic warfare. "ELISA is a technology project to demonstrate mapping of ground radar signals from space," said Nadege Roussel of DGA. "Satellites have the advantage of being able to view any point on the globe without encroaching on national airspace. France is the only European nation currently testing this type of space-based application." The satellites will drift to their correct position in orbit over the next three months before testing begins. The ELISA program is a partnership between CNES, DGA, the French Joint Space Command and the military's intelligence directorate. French Gen. Laurent Collet-Billon, director of DGA, said engineers will evaluate the technical performance of the ELISA satellites and incorporate the experience into the design of an operational signals intelligence satellite system to be launched by 2020. "Operations such as in Libya have shown to anyone who might still have doubts that space intelligence is absolutely essential for any country that wants to have a defense policy worthy of its name," Collet-Billon said. Chile's SSOT satellite, based on the French Myriade platform, will collect 4.8-foot resolution imagery for security, mapping, urban planning, and agriculture applications. "It is a special night for us," said Chilean Air Force Gen. Manuel Quinones, head of Chile's military logistics command. "It is a night where our first operational satellite will be alive. It will help us in order to create more development in our country, and become a safer country as well in defense matters." Astrium, the 258-pound craft's prime contractor, trained Chilean engineers and provided satellite control and image processing systems to help operate the spacecraft from Santiago.